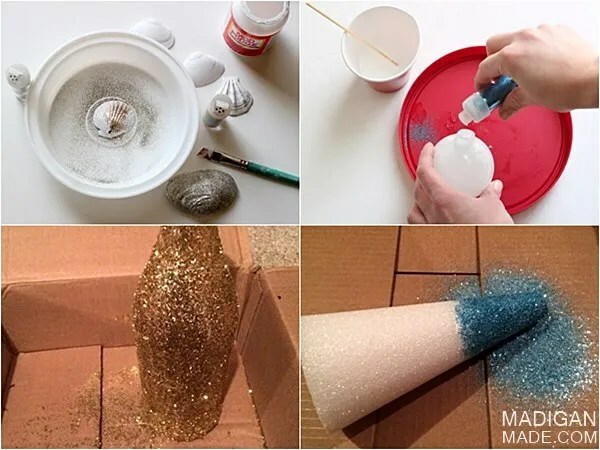 Make: important tips to know before using glitter. I confess. I have a small love affair with glitter. OK, it is more than a small crush, I admit! What do I like the most about glitter? Well, for very little money and effort, glitter can add gorgeous texture and depth to a surface. 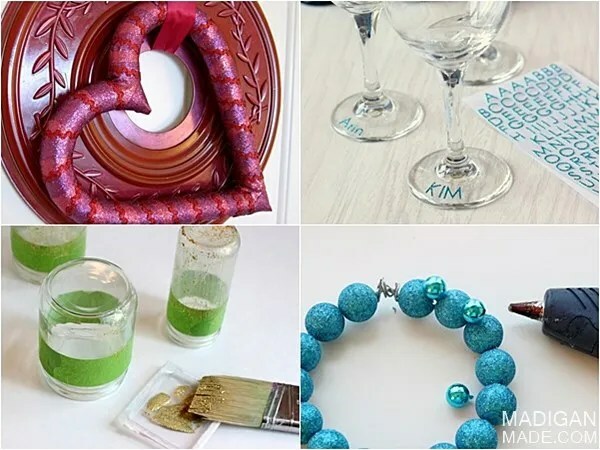 It is often is a quick, cheap and easy way to craft… which is another bonus! 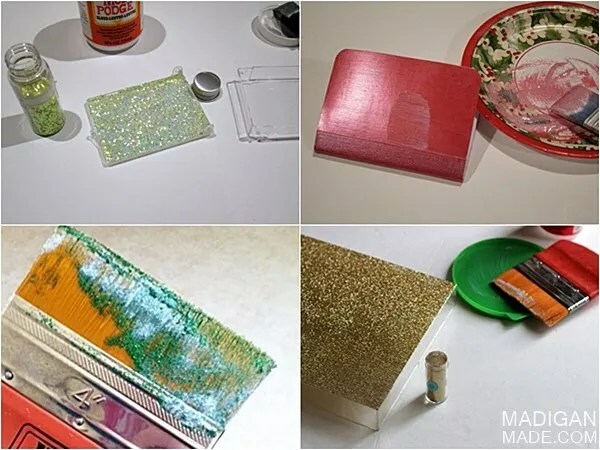 With the right planning, preparation, materials and sealant, I want to show you that crafting with glitter can be easy to do (and it won’t shed!). 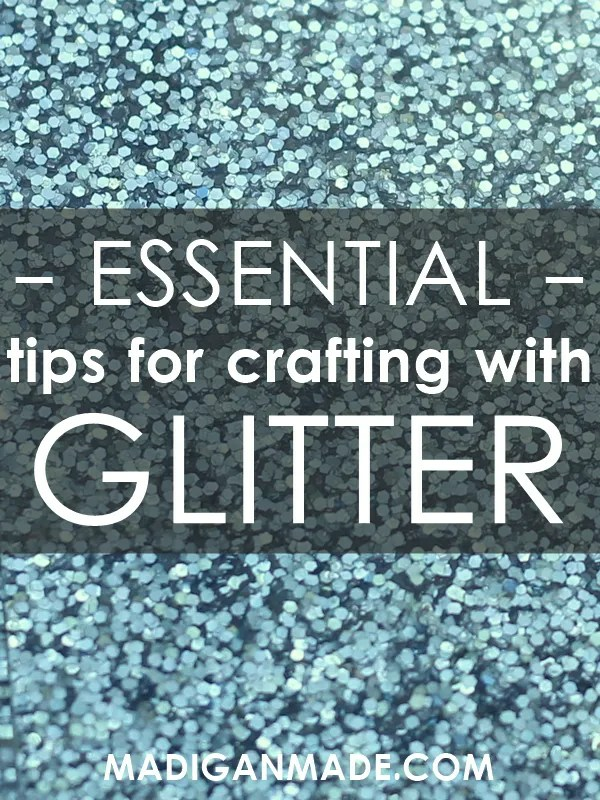 So, I thought I’d share with you my top tips for crafting with glitter. Note: some of the links below are affiliate links. I may earn a small commission from purchases made via them. 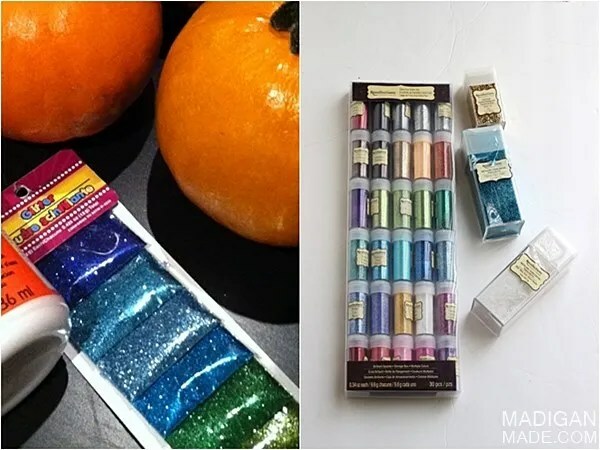 Sometimes you can find glitter at dollar stores (even ombre colored glitter! )… I personally find the quality of the glitter to be variable from there (it is often too chunky in texture for my taste). I buy most of my glitter at craft stores. I use a coupon or scour the clearance sections for Martha Stewart Glitter or Recollections brand glitter. We’ve all heard glitter called the “STD of crafting”. It gets that reputation for a reason: this stuff has the potential to go everywhere when you work with it! I find the best way to prevent the spread of this sparkle is to use a couple of preventative steps. First, work in an area where clean up will be simple. I find it easier to clean up over a hard floor surface or table (i.e.. my kitchen tile or basement concrete) versus a carpeted area. Second, and this is VERY important, sprinkle your project with glitter over a tray, lid or box. (or a trashcan if that works for you) If you use a tray, you can save and pour the glitter back in your bottle, if desired. How to adhere glitter to things. There are many ways to attach glitter to things. 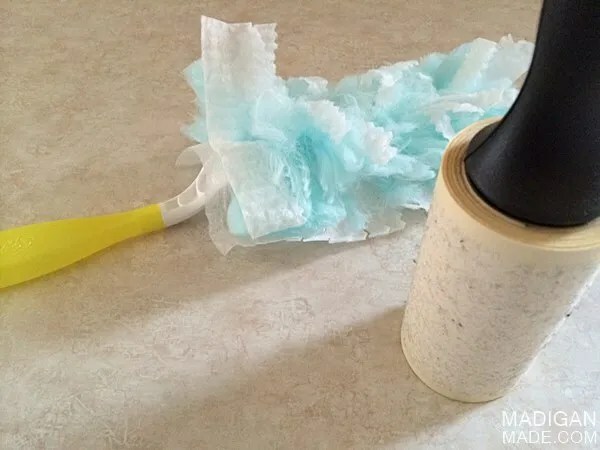 You can certainly use adhesive sprays and double sided tape. My favorite way to lay glitter down is with Mod Podge or plain white glue. I find with decoupage that the glitter sticks to my projects well and you can liberally cover the surface with glitter in one application. Sometimes, to ensure solid coverage (and to minimize the mess), I will mix glitter into the decoupage before I brush on the glue and then sprinkle more glitter on top. How best to seal glitter so it does not shed. Who wants a project that leaves a trail behind it? Not me. 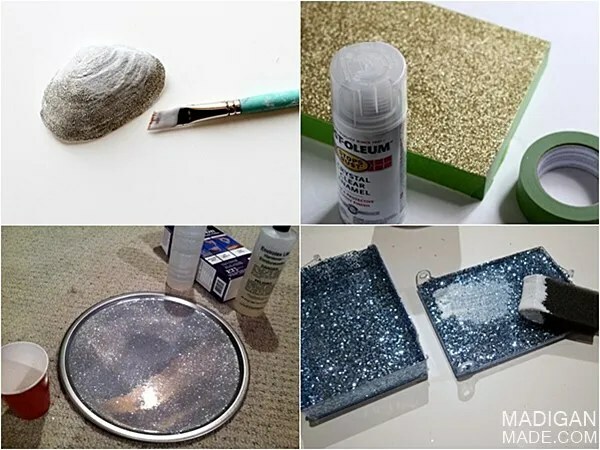 My favorite way to keep glitter from moving on my projects is usually to add another layer of decoupage or glue (mixed with a little water) over my surface area. To ensure the material does not move at all, I’ll often apply two coats. I find the sparkle does not move after that! 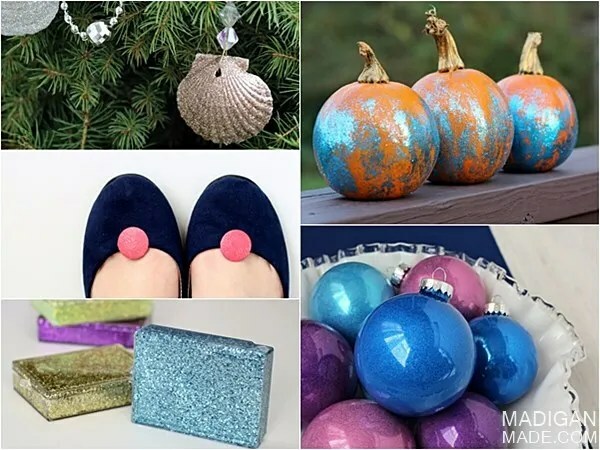 Other ways to seal glitter include using a pour-on resin or a clear spray sealant . The resin will protect your surface and basically embed the glitter to your project (like on a tabletop or tray). The clear spray will just add light protection. How to clean up glitter after you are done. Hopefully you did your best to contain the shiny mess as you crafted. But, inevitably, we all know that this sparkly material can migrate! I clean up my craft area immediately after working with glitter. I thoroughly vacuum/broom the floors and chairs in the room. I know there is a faction of crafters out there that cannot stand dealing with this potentially messy craft medium. I get it. I may not be able to convert you (yet!). 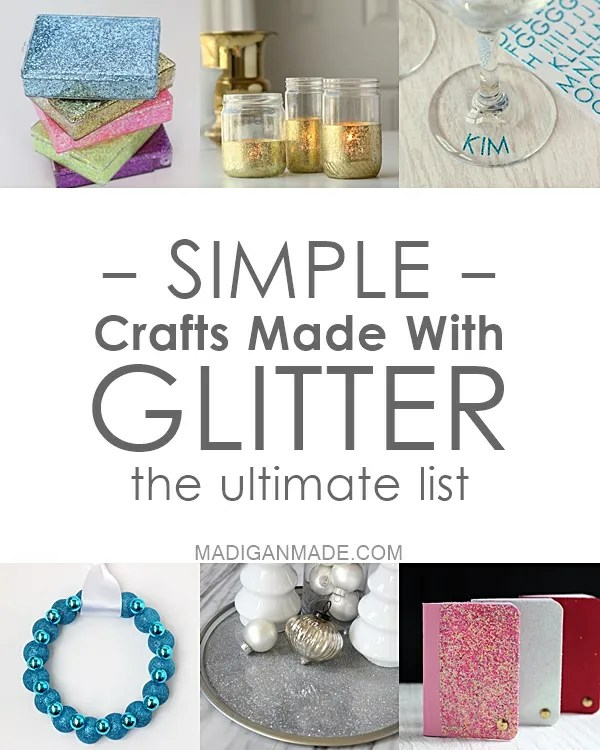 But I want to encourage you not to give up on glitter… there are other ways to craft with glitter that does not involve using the loose, sparkly powder. So, I hope these tips help and inspire you to add a little more sparkle to your life! I promise… it is worth the effort. I think y’all know my motto… When in doubt, just add glitter!